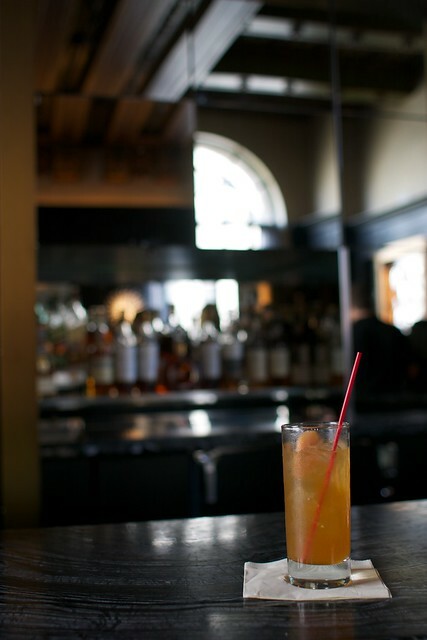 Our lunch started in the bar, which will feature a monthly rotation of two new non-alcoholic beverages along with a few more permanent items. We were offered samples of both the first month’s beverages, a citrus iced tea made with green and jasmine teas, grapefruit juice, and lemon/lime soda, and a strawberry lemonade flavored with fresh cilantro syrup. Wine director Brent Kroll and I discussed them and agreed the tea might be improved by a healthy slug of gin, while the lemonade could benefit from some bourbon, but you didn’t hear it from me. These are supposed to be healthy, you know, and some employers frown on lunchtime tippling. I won’t tell if you don’t, though. 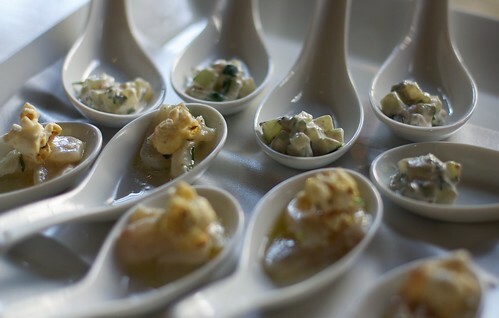 The beverage service was accompanied by two amuse-bouches, a tzatziki (there’s a recipe on page 50) and a dourade ceviche garnished with parsley and popcorn. Yes, popcorn. 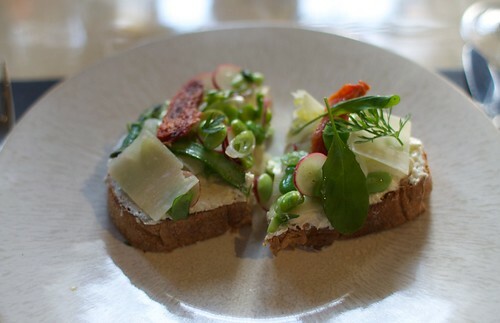 The first course, a spring vegetable tartine, is also in the pages of Nature (page 55), and is an excellent example of the chef’s focus on seasonality and healthy, filling dishes. It features fresh farmer cheese, shaved parmesan, fennel, asparagus, and other spring vegetables, on bread toasted “on one side.” It was indeed light yet filling, with the two cheeses nicely complementing the crisp vegetables. This was accompanied by a “cookpot of farro grain,” which isn’t in the cookbook. It had a consistency similar to risotto, but slightly less creamy, and cut with the salty punch of a Taggiasca olive. The main course was a fillet of John Dory. Again the chef’s focus was on food that is simple, and filling without being heavy. 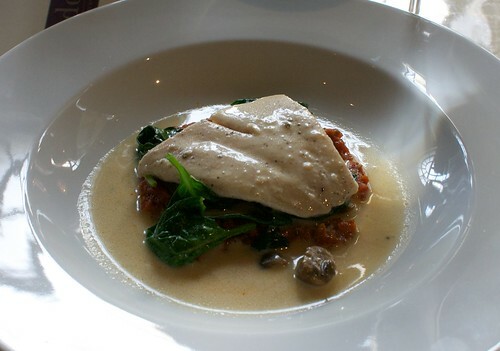 The John Dory was served on a bed of spinach and tomato, with a light mushroom sauce. The flavors were delicate and in perfect balance, with the fish itself providing an appealing creamy texture. 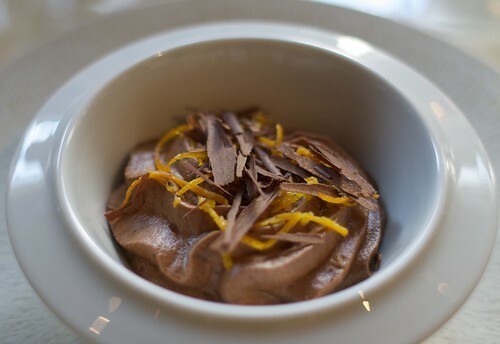 Finally the dessert course was dark chocolate mousse, topped with dark chocolate shavings and candied citrus peel. It was, well, chocolate mousse, which often feels obligatory to me. It was well enough executed but still managed to leave me flat. Three delicious dishes out of four ain’t bad, though. The new lunch program will start in April. Dinner service will include a new tasting menu inspired by Nature as well.